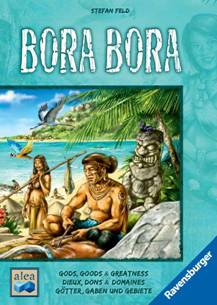 The mysterious island world of the South Pacific awaits. Build huts and settle them with the men and women of your tribe. Send priests to the temple and make offerings to worship the Gods. Strive for enormous prestige and even greater power! New Ascension Expansion from Stone Blade Entertainment! 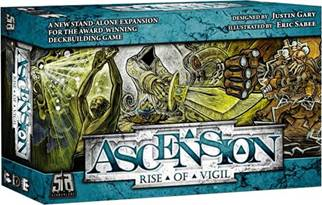 Ascension: Rise of Vigil is the newest chapter in the popular Ascension deck-building series. Rise of Vigil is both a standalone game playable on its own with 1-4 players and an expansion that can be combined with any of the earlier sets to support up to six players. As with other Ascension titles, Rise of Vigil is a deck-building game in which players acquire cards from a central pool to add to their decks for use later; at the same time, they also combat creatures and other things that show up in that shared space. Both cards acquired and creatures defeated earn a player points. Introduced in Ascension: Rise of Vigil are all new Treasure cards which will unlock powerful Energize abilities for the all new Heroes and Constructs. 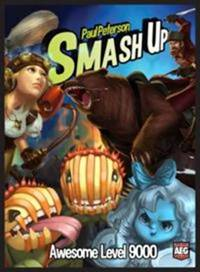 New Smash Up expansion from Alderac Entertainment! Thought you had enough awesome with Pirates, Ninja, and Zombies? Well get a load of this, bucko—Killer Plants, Steampunks, Ghosts, and Bear Cavalry are here to smash into your game! Plants grow out of control, Steampunks build on bases, Ghosts shriek out of the ether, and Bear Cavalry scare away the opposition. Two players can play with just these decks, or mix them with original-recipe Smash Up for up to 4 players, and feel your awesome level skyrocket!